When designing your course, these free e-learning template sites can save time and money...resulting in faster ROI attainment for your e-learning investment. Whether you’re an expert e-learning author or a beginner, it takes time, energy, and resources to design and implement your e-learning courses from scratch. The instructional design process alone can be overwhelming with content analysis and intensive tasks like screen composition, content integration, programming, testing, and evaluation steps that can demand a lot of time and labor to ensure your course is engaging and consistent. You don’t have to re-create the instructional design process to provide an effective e-learning course that will improve your ROI and have a positive effect on your productivity. 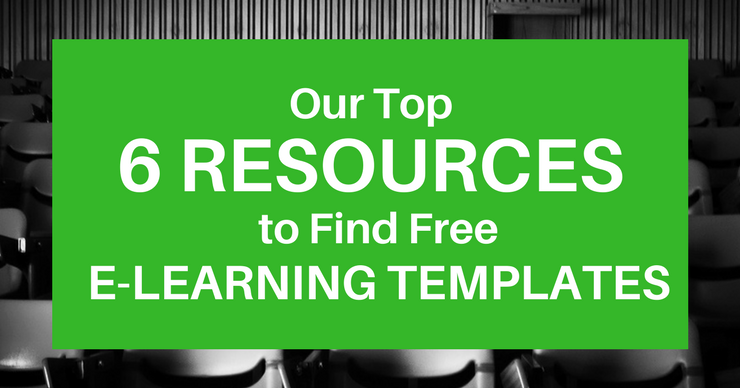 In fact, there are a massive amount of free e-learning templates that you can access right now. As the e-learning industry continues to grow, many brands are seeking a competitive advantage by offering reliable and free e-learning template designs on their website. These free templates can greatly reduce your development costs by providing you with flexible customization options as well as visual and technical consistencies to save you time so you can allocate your energy to your content creation. E-Learning Heroes' online library is packed with free e-learning templates that are conveniently organized by types that include: Storyline, PowerPoint, Presenter, Quiz Maker, Engage, and Replay templates. For example, their incredibly useful PowerPoint templates by Articulate 360 feature a click-and-reveal interaction that makes learning information less intimidating by allowing the user to break down the information on his or her own terms. You can use it to better communicate your services to your clients or you can customize it for another project. And with their Tablet Inspired Quiz Template, you can also create an interactive quiz and share it in no time! Upon signing up for a free account with Elearning Brothers, you can access over 75 templates that have been expertly built in Storyline, Adobe Captivate, Lectora, Powerpoint, Presenter and more. One of their free Captivate templates, for example, offers conversational scenarios that present your e-learning course users with interactive choices of how to proceed that are followed up with remediating responses that are shared with your users based on their answers. Best of all, you can duplicate the slides and edit this template to meet your unique branding needs. Another free template created in Adobe Captivate that’s sure to engage your users is their matching interaction template that allows learners to drag and drop images to match with their corresponding correct definitions. You can use either of these free templates to increase your course engagement in a consistent way while honing in on the value of your content. Faster Course may be a young e-learning development company, but they sure know how to make themselves available to their customers. With an extensive “freebie” library that offers a variety of free templates created in either Storyline, Captivate, or Lectora, Faster Course has become a leading resource for e-learning authors. Their free light Articulate Storyline templates contain 7 templates that are visually appealing, beautifully designed, and completely free to download. Likewise, their free Lectora Templates include a course intro page, image plus text page, hotspot page, single answer page, a drag and drop page, and page that you can easily customize your own images and text. As another trusted resource, Rapid Elearning Templates offers a variety of free downloads and sample templates for Captivate and Storyline users. Their Storyline Wooden Platform Template is especially handy for e-learning authors who are looking for professionally themed templates. The wooden platform refers to a cork board background that’s featured in all slides in addition to sticky note style buttons on one slide, a professionally dressed character on another, and a simple question and answer slide with photos. ELearningDom is known for building e-learning courses fast and intuitively and they offer a ton of “freebies” for their instructional designers and e-learning professionals to use. In their freebie library, you can find an assortment of clean templates created in Captivate that offer supporting text alongside images, vertical and horizontal comparison lists, a contrast template with up and down arrows, and more. Their animated timeline template with a subdued image background is especially useful to depict a course of events in a very visually appealing way that’s sure to be remembered. ELearning Art is a leading provider of e-learning images and templates for the e-learning industry with the largest library of e-learning assets on the web. They operate in diverse software programs that range from Articulate Presenter, Articulate Storyline, PowerPoint, Adobe Presenter, and Adobe Captivate free templates. As an added convenience, their long list of templates are also categorized based on their design use. As such, you can browse templates that are expertly designed with professional avatars, creative quizzes, interactive communication templates, conversational templates, display board templates, and so on.